From May 2012, Communications of the ACM (wording reverse-engineered from the solution given in the June 2012 edition as I don't have the May 2012 edition handy). each grid intersection (i.e. box corner) can have at most 1 diagonal touching it. In the grid above, the diagonal at the top-left is ok. The top-left box has 2 corners with 1 diagonal touching and 2 corners with 0 diagonals touching. Note that the box on its right cannot have a NW-SE diagonal ('\') since the NW corner already touches a diagonal). The 2 red diagonals can't both be used because they touch a common grid intersection. You can flip one of the red diagonals so they are arranged like '//' or '\\' (either way would be ok in this example), or drop one or both of them. Challenge: find the maximum number of diagonals that can be placed to satisfy the conditions, and prove that the number you found is maximal. There are 36 intersections, so that gives an upper bound of 18 diagonals. Look at the top row of six intersections. There are only five diagonals (maximum) in the top row of squares, and each diagonal in the top row of squares uses at most one intersection, so at least one of the top row intersections must be unused. 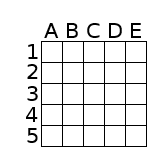 Similar logic holds for the bottom row, so there can be at most 17 diagonals. Assume WLOG that the bottom left and top right intersections are the only unused ones. (We need two unused intersections, at least one of which is in each outer row/column.) To place 17 slashes, we would have to use every intersection but those two. To use the top left corner, A1 must have a \. To use the one just below of that, A2 must have a \. This continues down the left column until we reach A5. At this point all the intersection in the left column have been used but one. The same reasoning, applied to the other outer rows and columns, says that all of the border is filled with \s. However, this causes D1 and E2 to both have a \, so that is impossible. Therefore 16 is our new upper bound. diagonals, but a proof of optimality still eludes me. There are $6*6=36$ boxes' corners. Each diagonal connects two corners. Thus we have an upper bound of $36/2=18$ diagonals. It is easy to achieve $15$ diagonals: just place NW-SE diagonals in each box in the first, third and fifth columns. Thus we have a lower bound of $15$ diagonals. My intuition is that it is impossible to stack more than 15 diagonals and that there should be an easy, visual, geometric proof for that. But that proof still escapes me. edit: as usual, my intuition proved wrong. See Jaap's nice solution. You can find example is in one of the previous answers. Suppose we got 17 diagonals. Notice that any rectangle 2*5 contains at most 6 diagonals, because it has exactly 6 intersections on it’s middle line. Consider now low rectangle and upper one. They both have at most 12 diagonals thus middle rectangle 1*5 has to have all 5 diagonals. Similarly, we can show that vertical middle rectangle 1*5 has to contain all 5 diagonals. WLOG let those diagonal be SW-NE. This yields the contradiction because diagonals in squares C2 and B3 have common intersection. 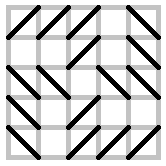 There are 16 inner grid intersections and you can have at most one diagonal per intersection.